EU-wide income inequality declined notably prior to 2008, driven by a strong process of income convergence between European countries. The Great Recession broke this trend. After 2008, income convergence has been sluggish, while inequality within many countries has increased significantly. Despite the implicit assumption stemming from many EU policy documents that European economic integration should lead to some degree of convergence between countries, studies adopting an EU-wide approach to mapping trends in income disparities remain surprisingly sparse. These are, however, especially necessary when the process of European integration has first been accelerated by the adoption of the euro and EU enlargement towards the East and then dramatically put to the test by the uneven impact of the Great Recession across Europe. The latest Eurofound report Income inequalities and employment patterns in Europe before and after the Great Recession helps to fill in this gap by mapping income inequalities from a truly EU-wide perspective between 2004-2013. Adopting an EU-wide perspective on income inequality requires considering income levels across European countries as part of a single EU-wide income distribution which reflects income disparities both between and within Member States. This is done in figure 1 (above) showing the percentage of European individuals aged 15-64 (vertical axis) reporting different levels of equivalised household disposable income (horizontal axis). For instance, around 4.5% of Europeans of working age have an (equivalised) household disposable income between €10,000 and €11,000 per year. Two main insights emerge regarding income disparities. The first is that income disparities between countries are evidenced by the different positions of countries, with Eastern European countries (and Mediterranean countries to a lesser extent) being much more present in the bottom income quintile, while EU15 countries account for almost all the people found in the top quintile. 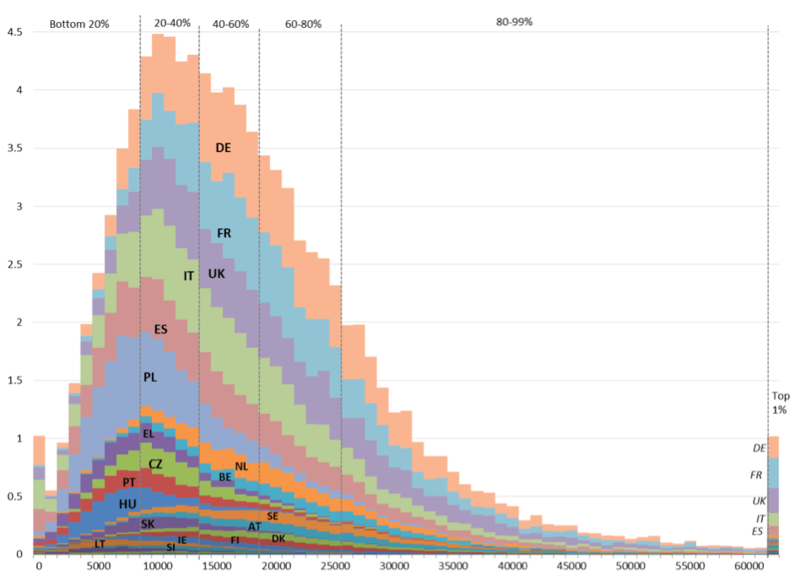 The second is that there is also a significant overlap in national income distributions (for instance the countries dominating the top quintile also have a significant share of population in the lowest income quintile), showing that income disparities within countries are larger than income disparities between countries in the European Union. EU income inequalities declined notably before the crisis, as measured both by the Gini and the Theil index. The latter shows that this was almost entirely due to a process of convergence in average income levels between countries, since inequalities within countries declined only very slightly. From 2008, the trend reversed, with EU-wide income inequalities modestly growing: the process of income convergence between countries faltered and an upwards trend in domestic inequalities developed. 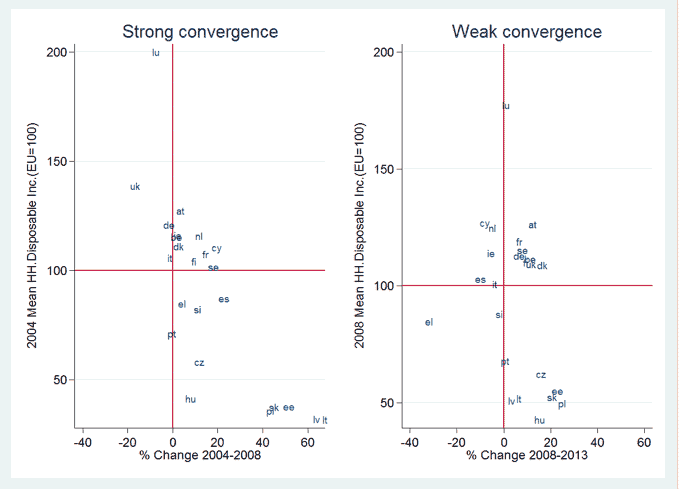 The pre-crisis convergence was largely a catch-up process among low-income countries, particularly strong in Eastern Europe (apart from Spain, Mediterranean countries failed to converge). In most high-income countries, income levels remained stable or even declined (notably in the UK) until 2008. After 2008, Mediterranean countries saw a decline in income levels while most Eastern European countries continued to grow but at a much lower rate. This, together with a return of income growth in the UK and Germany, led to a halt in the process of EU income convergence. Table 2 compares trends in income inequalities across countries before and after the effect of the public tax and benefit system is considered. Two main insights emerge. The first is that the Great Recession pushed market income inequalities upwards across almost all countries, and the main driver was labour income losses associated with unemployment. This is reflected by the fact that those countries most affected by growing unemployment between 2008 and 2013 are among those that suffered the largest surges in market inequalities (Mediterranean countries generally and Ireland), while the contrary applies to the European core countries generally (such as Germany, France, Austria, Luxembourg and the UK). Although not shown in the figure, the same labour market turbulences pushing market income inequalities upwards resulted in relatively stable levels of wage inequality (and even declining in some of the countries most hit by unemployment as Greece), since lower-paid employees were more likely to lose their job than the rest. The second is that the redistributive effect of European welfare states largely cushioned these growing inequalities, as reflected by significantly larger inequality increases in household market income than in household disposable income across several countries (Mediterranean countries generally, Latvia, Belgium, Netherlands, Finland and the UK). 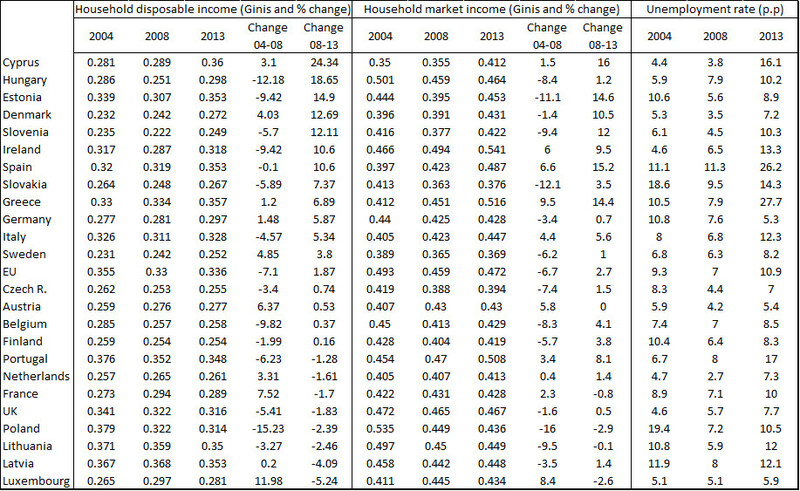 Household disposable income inequalities expanded in two-thirds of EU Member States between 2008 and 2013, and not only in peripheral countries severely impacted by the Great Recession but as well in some traditionally more egalitarian countries in the European core (Germany or Sweden). However, the increases have been quite moderate and only above 10% in seven countries (Cyprus, Hungary, Estonia, Denmark, Slovenia, Spain and Ireland). On the contrary, household disposable income inequalities fell in one third of the countries over the same period (Luxembourg, Latvia, Lithuania, Poland, the UK, France, The Netherlands and Portugal). Overall, the Great Recession reversed previous trends and pushed income inequalities upwards across most European countries largely due to growing unemployment, while EU-wide inequalities increased partially due to the income convergence between countries stalling. Nevertheless, the surges in income inequalities were generally moderate largely as a result of the cushioning impact of European tax and benefit systems.